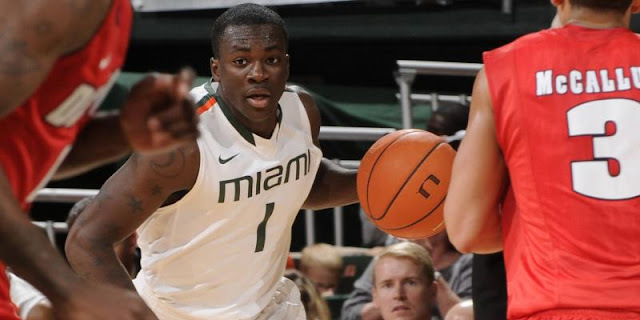 Miami’s Durand Scott has been named the ACC Player of the Week and NC State’s T.J. Warren has been selected the conference’s Rookie of the Week. With 16 points and 12 rebounds, Scott led Miami to a 77-46 win Friday night over previously undefeated Charlotte in the Hurricanes’ lone game of the week. The Bronx, N.Y., senior was 5-of-8 from the floor (.625), including 2-of-3 from 3-point range, handed out four assists and came up with four steals and blocked one shot as Miami upped its record to 6-1 with its fifth straight win. On the year, Scott is averaging 15.3 points and 7.5 rebounds per game and is shooting .575 from the field and .722 from the free throw line. In being named ACC Rookie of the Week for the second time this season, Warren came off the bench to score a game-high 21 points, leading NC State to a 84-62 win over Norfolk State Saturday. The Durham, N.C., guard was 9-for-11 from the floor (.818), including hitting 2-for-2 from 3-point range for his best shooting performance of the season. In addition to leading the Wolfpack in scoring for the fourth time this season, he also pulled down five rebounds and had two steals in 28 minutes of action. On the year, Warren leads all ACC freshmen in scoring (14.6) and is shooting .691 from the field, which leads the ACC and ranks third nationally.